Starting now through Monday, February 20th 11:59pm PST, take advantage of the following deals using the code "PREZDAY" at checkout. Note that your shopping cart will only show a discount of $.01; Your free accessories will be added AFTERWARDS. 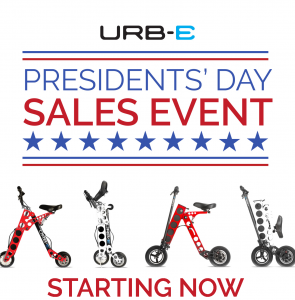 URB-E Sport - Free Shipping* (save $125) - Autographed Limited Edition VIN Badge URB-E Sport GT - Free Shipping* (save $125) - Autographed Limited Edition VIN Badge - Free Basket URB-E Pro - Free Shipping* (save $125) - Free Basket - Free American Flag Inserts URB-E Pro GT - Free Shipping* (save $125) - Free Basket - Free American Flag Inserts - Free Leather Handle Strap - Free Front Vertical Kickstand Compare all models here! *Free shipping only applies within the Continental United States.